Through a brief account of the evolution of city design discourses in the United States, this chapter examines the influence of the everyday and the bottom-up in American city design. 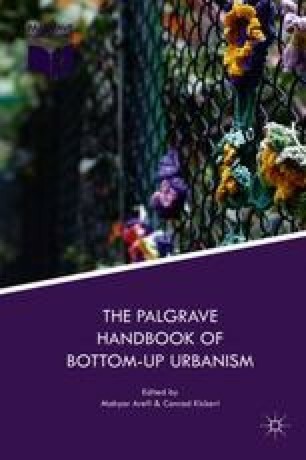 It argues that bottom-up, everyday urbanism presents a recurring theme in the discourses of city design in America. Rather than esoteric diversions or frivolous interventions, bottom-up urbanism, as embodied in the non-pedigreed, spatial practices of ordinary citizens has arguably been a constant source of inspiration and innovation for theories and practices in American city design and should be recognized as having a central and defining role in its evolution. An earlier version of this chapter was written in 2013 for a proposed book Companion to American Urbanism. Although the book did not materialize in the end, the author wishes to thank the editor Joseph Heathcott for the opportunity to conceptualize this piece. He is also grateful to the editors of this book, Conrad Kickert and Mahyar Arefi, for providing a new home for this work, and to the anonymous reviewers for their critical comments and suggestions. US Census. (2012). Growth in urban population outpaces rest of nation, census bureau reports, on the Internet at http://www.census.gov/newsroom/releases/archives/2010_census/cb12-50.html. Accessed August 29, 2013.